The next logical step up from extract brewing, grain brewing allows you full control over the beer style, colour, flavour and bitterness - the only limit is your imagination. There are literally hundreds of recipes out there, both online and in brewing literature, and if there's a commercial beer you wish to emulate, there's likely to be a clone recipe out there somewhere. It's even more fun to make up your own recipes! You will need all the equipment for extract brewing, i.e. all the gear to boil, cool, ferment and bottle or keg your brew, and in addition, you will need a mash tun. The mash tun is simply an insulated vessel in which you mix grains and hot water together and allow them to stand for about and hour to an hour and a half. 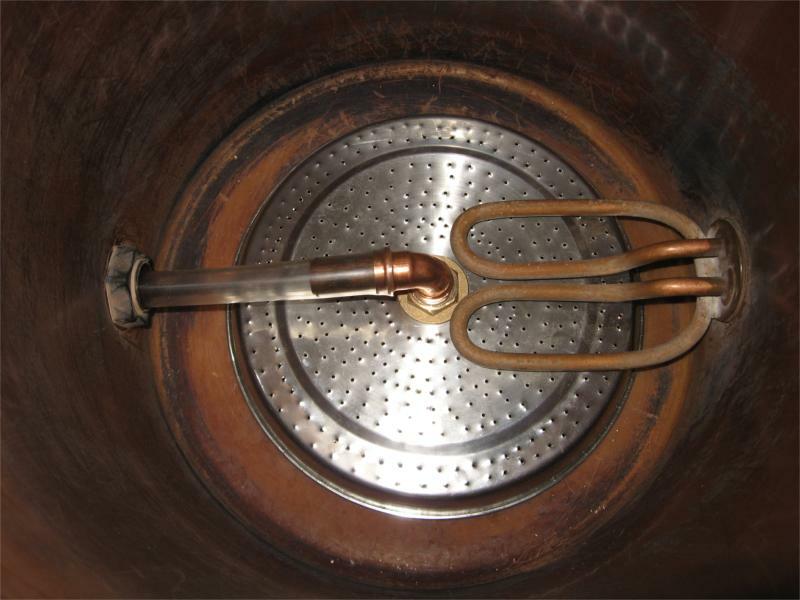 Most mash tuns are built with a perforated false bottom or other filter to allow the sweet wort to be drained off from the grains after mashing. Run off the sweet wort at the end of the mash while leaving the grains behind (i.e. strainer or 'false bottom'). My own mash tun is made from a modified plastic brewing boiler wrapped with insulating foam and fitted with a stainless steel false bottom linked to the tap by a tube (see picture above - it's not pretty, but it does the job!). This is a very popular arrangement - it doesn't have to be a boiler; any plastic or stainless steel vessel of appropriate size and shape will do. Another popular and easy-to-make mash tun is the picnic cooler mash tun - you can see examples of this in the Equipment section.